Perhaps the most important–and perhaps least obvious–feature of your roof in determining the durability of your roof is pitch. Also known as "slope," pitch is the change in roof height (or rise) for a horizontal distance (or run). Usually expressed as "4 in 12," with 4 inches of rise to 12 inches of run, pitch weighs heavily in determining the type of roofing material that can be utilized on any given roof. Because a higher (steeper) pitch provides better drainage, generally speaking, the more pitch a roof has the longer lasting it will be. 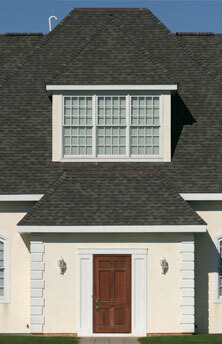 Knowing the approximate pitch of your roof can be helpful for making many roofing repair and replacement decisions. There are many methods of determining the pitch of your roof; the simplest is to measure it directly. To do this, you will need a 3- foot board, carpenter's level and a ruler. Begin by laying the board flat on the roof, running straight up and down the slope. Then mark a point on the level that is 12 inches from one end and place the end of the level from where you measured near the top of the board. Next, raise the other end of the level until it is "level." Hold the ruler perpendicular (the two will cross each other and form an "X") to the level at the 12-inch mark; measure from the board to the bottom of the level. The distance you find here will give you the "rise" portion of your roof's pitch. For example, if your measurement is 6 inches, you have a "6 in 12" pitch.